For chemists and other scientists who, like Stephan Schürer, Ph.D., are immersed in the early phases of new drug discovery, PubChem is a treasure trove. The largest public database of small molecule screening data accessible to anyone in the world contains thousands of experiments on hundreds of thousands of compounds with millions of values. Yet the true value of this public repository of chemical compounds and their potential use as therapeutic agents has been limited because researchers cannot easily search or compare the complex and voluminous data it contains, nor integrate them with other data sources. Until now, that is. 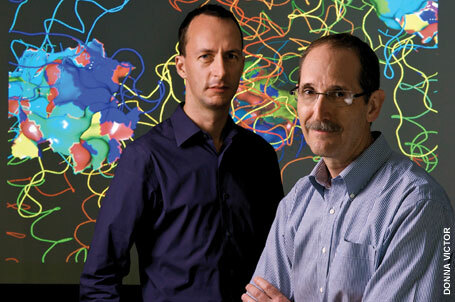 Just 18 months after receiving one of the University’s largest NIH stimulus grants, Schürer, associate professor of molecular and cellular pharmacology, along with co-principal investigator Vance Lemmon, Ph.D., professor of neurological surgery and the Walter G. Ross Distinguished Chair in Developmental Neuroscience, and their team of programmers and computer scientists have developed and released an ontology—a controlled vocabulary to enable computers to decipher complex concepts and relationships—that researchers can use to annotate high throughput screening assays before uploading them to PubChem, or other public data bases. The starting point for drug design, high throughput screening allows researchers to rapidly test tens or hundreds of thousands of compounds to identify one that modulates a particular biomolecular pathway. For the complete story, click to visit the Miller School of Medicine News website.